Congratulations on your engagement! 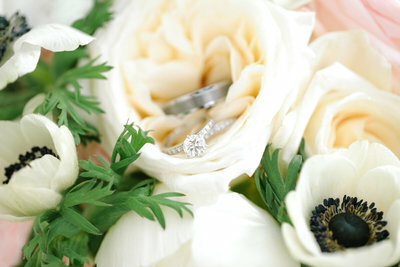 You know you are planning to get married in Savannah, but the big question is: where? Have you considered a Savannah city square? Savannah is known for its stunning antebellum architecture, historic significance (Savannah, after all, was a strategic port city during the Revolutionary and Civil Wars, as well as the birthplace of the Girl Scouts founder, Juliette Gordon Low), and rich cultural and artistic contributions. And the historic Savannah squares located in the heart of the city are the perfect place to celebrate your love and the start of the next chapter of your lives together. Savannah originally had 24 city squares, providing locals and visitors with restful greenery in between the historic houses and businesses. Two squares were later lost to city development while other squares have been improved and redesigned. The squares are shaded by majestic live oaks and surrounded by beautiful architecture and buildings, from charming homes to charming inns, enchanting churches, and stately museums. 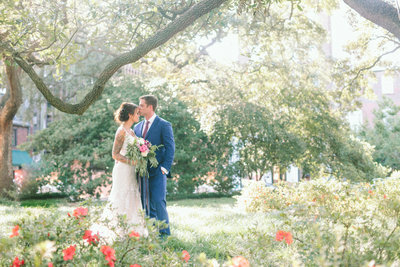 Savannah's squares are much-coveted areas for intimate outdoor weddings, and with 22 squares to choose from, you are sure to find one that is perfect for you. *Calhoun Square is located two blocks north of Forsyth Park, at the corner of Abercorn and Wayne Streets. Calhoun Square used to be a retreat for school children and a backyard for residents living in the heart of downtown Savannah. *Chippewa Square is one of Savannah's most popular squares. Located right in the center of everything from ice cream parlors to ice cream parlors, it was even featured in the movie Forrest Gump. *Columbia Square is a quiet sanctuary in the middle of the bustling downtown streets. Featuring a lovely water fountain surrounded by red brick pavement, Columbia Square is located in the northeast quadrant of the Historic District, at the junction of the Habersham and President streets. Crawford Square with its own small park containing a basketball court and gazebo, Crawford Square is located at Houston and McDonough streets. Elbert Square was laid out across from the Savannah Civic Center in 1801, but paved over in urban development later on. Ellis Square is one of Savannah's most lively squares, located as it is right next to the City Market with its multiple restaurants and shops. Ellis square features a life-size chess set, rentable bikes, shaded tables, and a water fountain. Franklin Square is located on the West side of City Market, close to several bars on Congress Street to the West. *Greene Square is a lovely park-esque square with benches and plenty of green space for a picnic. *Johnson Square is Savannah's oldest and largest square, nestled in the middle of some of the most majestic downtown buildings, such as the Christ Episcopal Church, City Hall, and several large banks. Lafayette Square is home to the Cathedral of St. John the Baptist, with its iconic twin steeples designed by architect Francis Baldwin. Liberty Square was laid out in 1799 but was paved over in construction of the Chatham County Courthouse. *Madison Square features a variety of great restaurants and shops nearby, as well as vintage cannons from the old Savannah Armory. *Monterey Square includes a monument in honor of General Casimir Pulaski as well as The Mercer House. The square is located at Bull and Wayne streets. *Oglethorpe Square honors the founder of Savannah, and Georgia itself, General James Oglethorpe. It includes a brick sidewalk lined with benches, perfect for a shaded break after a vigorous walk. Orleans Square is located behind Savannah's Civic Center and College of Art and Design's Oglethorpe House. It features the German Memorial Fountain and is located at Barnard and McDonough Streets. *Pulaski Square is one of the few squares without a monument, named after Revolutionary War hero Polish Count Casmir Pulaski. It features live oaks and thick ivy groundcover. Reynolds Square is surrounded by exciting and entertaining restaurants and performance venues, from the Ole Pink House and Lucas Theater to Leopold's Ice Cream and Trustees' Theater. *Telfair Square is located right beside the Telfair Acadey and Jepson Center and was renamed in honor of the Telfairs' contributions to Savannah's culture. *Troup Square includes a fascinating monument and a fountain just for visitors' four-legged friends. *Warren Square is a neighborhood square named in honor of Revolutionary War hero General Joseph Warren. Giant live oaks keep the square well shaded at the corner of the Habersham and saint Julian streets. Washington Square used to be the Trustees' Garden, where colonists raised experimental crops. Today it serves as the perfect location for a leisurely stroll. Whitefield Square features a Victorian gazebo and azalea flowers, and is particularly popular for hosting outdoor weddings. *Wright Square includes two great monuments: a statue and enormous boulder, each with their own stories. To reserve a Savannah square for your wedding, contact the Savannah Parks Department to fill out an application and pay a reservation fee. Permits are given on a first-come, first-served basis, and applications must be submitted in writing at least five days before the planned event with detailed outlines regarding activities and events (including event type, expected attendance, use of tents, electricity, entertainment, etc). For more information, the city of Savannah provides specific details about fees, rules and guidelines in their pdf document for interested couples. Depending on which city square you choose for your wedding, there are virtually limitless opportunities for capturing romantic, natural, stunning wedding photos in the Savannah Historic Squares. Many couples opt to have their ceremony in one square, then take a carriage or car to nearby squares for additional photos. Located in the heart of Savannah, with easy access to Savannah's Historic District, River Street, and City Market, hosting a wedding in one of the many beautiful squares also give couples the opportunity to take creative wedding photos in nearby communities, next to a museum, perhaps, or by a charming church or other historic building. 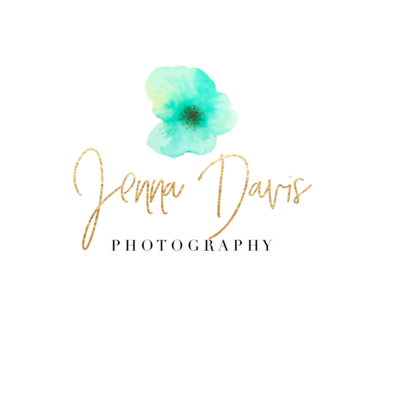 Here at Jenna Davis Photography, I have a passion for documenting love stories and capturing precious moments! As a Savannah photographer, I am intimately familiar with the Savannah squares and the myriad of photography opportunities available in and around the area. Weddings last for one day, but photos are forever. 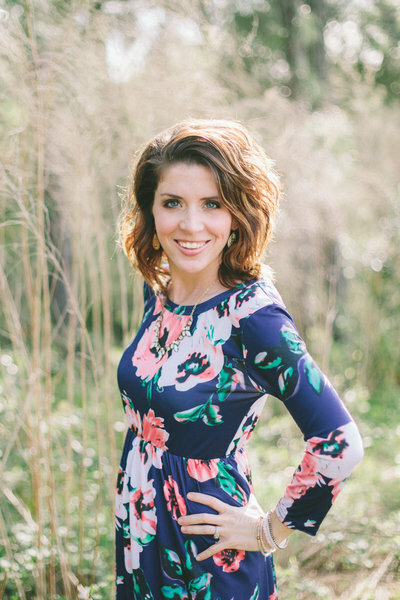 With my expertise in the area and eye for detail, I will help you memorialize the most beautiful memories from your special day in gorgeous photographs that you and your loved ones can cherish for years to come. I can't wait to hear from you!